Kuhl's pipistrelle is a rather small bat with a fur colour varying from pale beige to ochre. In addition to its reddish-brown ears, this species usually exhibits a white edge of variable width at the free edge of the wing and tail membrane. The species dentition is particularly helpful in distinguishing it from other pipistrelles. 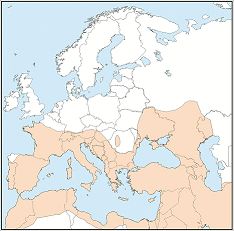 Abundant in the Mediterranean basin, Kuhl's pipistrelle is comfortable in both agricultural and urban habitats. It is often associated with human settlements and roosts in tree/cliff crevices and in building gaps and cellars. This is a very agile species, which can feed on mayflies, mosquitoes, moths and other insects while in flight. Kuhl's pipistrelles can become rather sedentary. Range extends from Iberia through southern Europe through the Near East and the Caucasus to Kazakhstan, Pakistan, and India. Northern European limit currently at 51°N in Ukraine. Very common in human settlements in the Mediterranean area. Colonies and individuals sometimes threatened by re-developments.